Sherpa has been working hard getting the new 2014 site up this fall and now it is finality live! We have focused our area of speciality from a broader range of development and design work including Magento and Drupal to hone in on WordPress Developer and WordPress Designer services since it’s what we are best at. Taking PSDs (Photoshop files) and translating them to pixel perfect WordPress websites is one of our specialties. Using either an existing HTML site or provided HTML framework we can create an amazingly easy to manage WordPress site for you. We develop solid, stable, easy to use and upgrade wordpress websites that can be used for years to come. 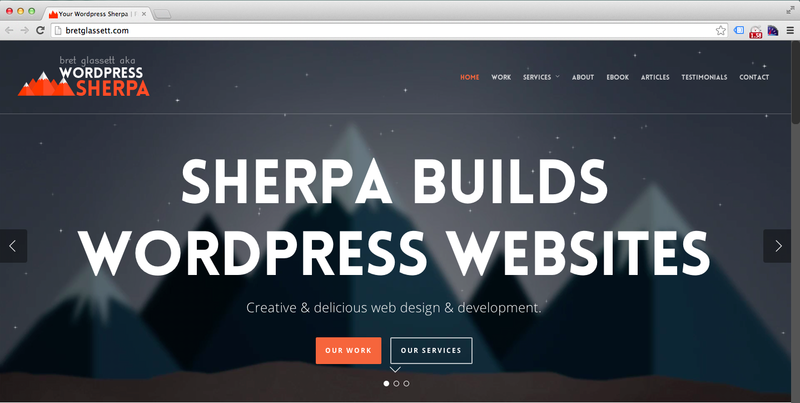 Skilled in creating cross-browser friendly, responsive wordpress themes, Sherpa can translate or create a new custom design for your theme. If there is not an existing plugin with the functionality your site needs we can build it for you – from small and simple to complex. No PSD’s no problem. We have been designing sites for years and can create you from scratch a stunning wordpress website theme. If you have an existing WordPress website and theme which you want customized or have functionality added to. If you do not have PSD’s and need website designed look no further – I have designers that I work with that will create designs nothing short of stunning. Developing websites is my speciality; often using WordPress for your CMS that will allow you to easily and effortlessly manage your sites content.